Why Is This Engagement Ring Style So Popular? The "perfect" engagement ring differs for each of us. Sure, one future bride may want maximum sparkle, but for others, it's more about keeping things classic. But surprisingly or not, as with other accessories, trends wax and wane for engagement rings. And as of late, there is one specific trend that seems to have staying power: pear-cut engagement rings. 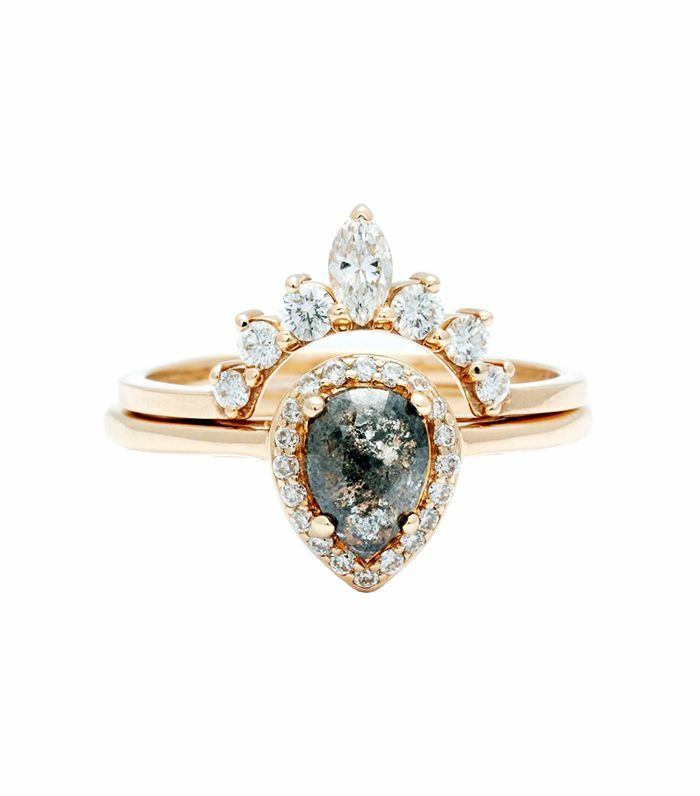 "The pear shape has always been a beautiful option for the classic but still a bit unconventional bride-to-be," says jewelry designer Anna Sheffield. "It's a combination of a marquise cut and a round-faceted stone, a very elegant and intentional shape for a diamond. Also, they can be lighter in carat than they appear, which is a plus!" The rise of the pear cut falls in line with a general shift in engagement ring preferences. Buyers are moving away from traditionally favorited high-carat styles for unique rings. Sheffield adds, "people no longer have a status quo for the symbol of their love. They want something that speaks to their individuality and their values." For anyone who may feel intimidated by the asymmetrical shape, Sheffield recommends balancing it out with a coordinating wedding band or pairing it with bezels to cushion the cut. The beauty of engagement rings is that while the diamond may be the same, there are so many ways to make the ring feel special. Read on to shop a few of our favorite pear-cut engagement rings now! Want more? See these real women's engagement rings!